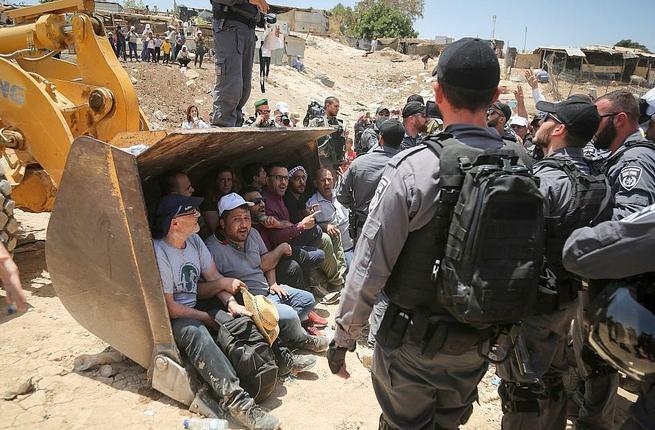 Like vultures, Israeli soldiers descended on Khan Al-Ahmar, on Sep. 14, recreating a menacing scene with which the residents of this small Palestinian village, located East of Jerusalem, are all-too familiar. The strategic location of Khan Al-Ahmar makes the story behind the imminent Israeli demolition of the peaceful village unique amid the ongoing destruction of Palestinian homes and lives throughout besieged Gaza and Occupied West Bank. Throughout the years, Khan Al-Ahmar, once part of an uninterrupted Palestinian physical landscape has grown increasingly isolated. Decades of Israeli colonization of East Jerusalem and the West Bank left Khan Al-Ahmar trapped between massive and vastly expanding Israeli colonial projects: Ma’aleAdumim, KfarAdumim among others. The unfortunate village, its adjacent school and173 residents are the last obstacle facing the E1 Zone project, an Israeli plan that aims to link illegal Jewish colonies in Occupied East Jerusalem with West Jerusalem, thus cutting off East Jerusalem completely from its Palestinian environs in the West Bank. Like the Neqab (Negev) village of Al-Araqib, whichhas been demolished by Israel and rebuilt by its residents 133 times, Khan Al-Ahmar residents are facing armed soldiers and military bulldozers with their bare chests and whatever local and international solidarity they are able to obtain. Despite the particular circumstances and unique historical context of Khan Al-Ahmar, however, the story of this village is but a chapter in a protracted narrative of a tragedy that has extended over the course of seventy years. It would be a mistake to discuss the destruction of Khan Al-Ahmar, or any other Palestinian village outside the larger context of demolition that has stood at the heart of Israel’s particular breed of settler colonialism. It is true that other colonial powers used destruction of homes and properties, and the exile of whole communities as a tactic to subdue rebellious populations. The British Mandate government in Palestine used the demolition of homes as a ‘deterrence’ tactic against Palestinians who dared rebel against injustice throughout the 1920s, 30s and 40s, till Israel took over in 1948. Yet the Israeli strategy is far more convoluted than a mere ‘deterrence’. It is now carved in the Israeli psyche that Palestine must be completely destroyed in order for Israel to exist. Therefore, Israel is engaging in a seemingly endless campaign of erasing everything Palestinian, because the latter, from an Israeli viewpoint represents an existential threat to the former. This is precisely why Israel sees the natural demographic growth among Palestinians as an ‘existential threat’ to Israel’s ‘Jewish identity’. This can only be justified with an irrational degree of hate and fear that has accumulated throughout generations to the point that it now forms a collective Israeli psychosis for which Palestinians continue to pay a heavy price. The repeated destruction of Gaza is symptomatic of this Israeli psychosis. Israel is a “country that when you fire on its citizens it responds by going wild – and this is a good thing,” was theofficial explanation offered by Tzipi Livni, the Israeli foreign minister in January 2009 to justify its country’s war on the blockaded Gaza Strip. The Israel ‘going wild’ strategy has led to the destruction of22,000 homes, schools and other facilities during one of Israel’s deadliest wars on the Strip. A few years later, in the summer of 2014, Israel went ‘wild’ again, leading to an even greater destruction and loss of lives. Israel’smass demolition of Palestinian homes in Gaza, and everywhere else, preceded Hamas by decades. In fact, it has nothing to do with the method of resistance that Palestinians utilize in their struggle against Israel. Israel’s demolishing of Palestine – whether the actual physical structures or the idea, history, narrative, and even street names – is an Israeli decision through and through. A quick scan of historical facts demonstrates that Israel demolished Palestinian homes and communities in diverse political and historical contexts, where Israel’s ‘security’ was not in the least a factor. Nearly 600 Palestinian towns, villages and localitieswere destroyed between 1947 and 1948, and nearly 800,000 Palestinians were exiled to make room for the establishment of Israel. According to theLand Research Center(LRC), Israel had destroyed 5,000 Palestinian homes in Jerusalem alone since it occupied the city in 1967, leading to the permanent exile of nearly 70,000 people. Coupled with the fact that nearly 200,000 Jerusalemites were driven out during the Nakba, the Catastrophe’ of 1948, and the ongoing slow ethnic cleansing, the Holy City has been in a constant state of destruction since the establishment of Israel. In fact, between 2000 and 2017, over 1,700 Palestinian homes were demolished, displacing nearly 10,000 people. This is not a policy of ‘deterrence’ but of erasure – the eradication of the very Palestinian culture. Combined with the destruction of Palestinian villages upon the establishment of Israel, and the demolition of Palestinian homes inside Israel itself, ICAHD puts the total number of homes destroyed since 1948 at more than 100,000. In fact, as the group itself acknowledges, the figure above is quite conservative. Indeed, it is. In Gaza alone, and in the last 10 years which witnessed three major Israeli wars, nearly 50,000 homes and structures werereportedly destroyed. So why does Israel destroy with consistency, impunity and no remorse? It is for the same reason that it passed laws to change historic street names from Arabic to Hebrew. For the same reason it recently passed the racist Nation-state law, elevating everything Jewish and completely ignoring and downgrading the existence of the indigenous Palestinians, their language and their culture that goes back millennia. Israel demolishes, destroys and pulverizes because in the racist mindset of Israeli rulers, there can be no room between the Sea and the River but for Jews; where the Palestinians – oppressed, colonized and dehumanized – don’t factor in the least in Israel’s ruthless calculations. This is not just a question of Khan Al-Ahmar. It is a question of the very survival of the Palestinian people, threatened by a racist state that has been allowed to ‘go wild’ for 70 years, untamed and without repercussions.